This article is about the bridge complex in the Washington, D.C., metro area. For other bridges of 14th streets, see 14th Street Bridge (disambiguation). The 14th Street bridges are five bridges near each other that cross the Potomac River, connecting Arlington, Virginia and Washington, D.C. A major gateway for automotive and rail traffic, the bridge complex is named for 14th Street (U.S. Route 1), which feeds automotive traffic into it on the D.C. end. The complex contains three four-lane automobile bridges—one northbound, one southbound, and one bi-directional — that carry Interstate 395 (I-395) and U.S. Route 1 (US 1) traffic. In addition, the complex contains two rail bridges, one of which carries the Yellow Line of the Washington Metro; the other of which, the only mainline rail crossing of the Potomac River to Virginia, carries a CSX Transportation rail line. 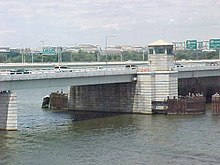 At the north end of the bridge, in East Potomac Park, the three roadways feed into a pair of two-way bridges over the Washington Channel into downtown Washington, one carrying traffic (including northbound US 1) north onto 14th Street, and the other carrying I-395 traffic onto the Southwest Freeway. The Metro line enters a tunnel in the East Potomac Park, and the main line railroad from the Long Bridge passes over I-395 and runs over the Washington Channel just downstream of the 14th Street approach before turning northeast along the line of Maryland Avenue. The original bridge ran to the junction of 14th Street and Maryland Avenue, with access to either for cars. On January 13, 1982, 78 people were killed when Air Florida Flight 90 crashed into the northbound I-395 span of the bridge during rush hour. The repaired span was renamed in honor of Arland D. Williams Jr., a passenger on the plane who survived the initial crash, but drowned after repeatedly passing a helicopter rescue line to other survivors. The 1903 (rebuilt c. 1943) Long Bridge carries CSX, Amtrak and Virginia Railway Express rail traffic over the river. The name "seems to have been derived from its planned size and not as a memorial to any particular individual." The 1983 Charles R. Fenwick Bridge—named for the Virginia state senator who helped create the Washington Metropolitan Area Transit Authority—carries the Yellow Line of the Washington Metro across the river. The northbound span was originally named the 14th Street Bridge when it opened in 1950, renamed the Rochambeau Bridge eight years later, and renamed the Arland D. Williams Jr. Memorial Bridge in 1983 for a passenger of Air Florida Flight 90 who died saving others from the freezing water. At that time, the Rochambeau Bridge name was moved to the previously unnamed center bridge, which opened in 1972 and carries traffic in both directions. The southbound span, opened in 1962, is named the George Mason Memorial Bridge. A footpath is on the upstream side of the bridge for pedestrians and cyclists. 1818 map shows the Long Bridge between the words "Potomac" and "River". The first bridge at the site was the Long Bridge, a wooden toll bridge opened on May 20, 1809, by the Washington Bridge Company. It was the second bridge to cross the Potomac in the District of Columbia, following a 1797 span at a narrower crossing near Little Falls, upstream of Georgetown, at the site of the present Chain Bridge. British forces leaving the Battle of Bladensburg during the War of 1812 set fire to the north end of the Long Bridge on August 25, 1814, and American troops burned the south end. The bridge was rebuilt by 1816. The western portion was carried away by an ice freshet on February 23, 1831, and Congress decided to purchase the franchise of the Washington Bridge Company on July 14, 1832. A ferry carried traffic across the river until October 30, 1835, when the bridge was reopened by President Andrew Jackson. Another freshet struck on February 10, 1840, closing the bridge until 1843. A rail line over the Potomac had been envisioned at least since 1835, when the Washington Branch of the Baltimore and Ohio Rail Road connected the capital city to points north. In 1855, the Alexandria and Washington Railway was chartered to connect the B&O to other railroads in Alexandria, by then part of Virginia. A city ordinance passed July 27, 1855, authorized the A&W to build tracks from the B&O's Washington terminal to the Long Bridge. By December, tracks had been completed from the terminal south along First Street, past the United States Capitol and along Maryland Avenue to the bridge. This line never opened due to local opposition and the inability to lay tracks on the bridge. But the A&W did complete its Virginia line, from the bridge's southern end to downtown Alexandria, on November 25, 1856. To reach Washington and the B&O, freight and passengers had to use an omnibus connection over the bridge. The bridge was again washed out by a flood in February 1857, but was reopened in time to allow revenue service on the A&W with connecting service over the bridge to begin on December 21, 1857. With the outbreak of the American Civil War in 1861, the bridge became militarily important. Union troops occupied the bridge on May 24, and the Orange and Alexandria Railroad soon became a major center for the United States Military Railroad Construction Corps. Rails were placed on the bridge, and the new connection opened on February 9, 1862. Locomotives proved too heavy, so trains were pulled by horses across the bridge. On July 23, 1864, a new, stronger bridge was completed about 100 feet (30 m) downriver. Opened on February 21, 1865, the new bridge carried only railroad traffic, and the old one was kept for other traffic. On November 15, 1865, with the end of the war, the U.S. Military Railroad gave the old bridge to the U.S. Department of the Interior; the new bridge became part of the Washington, Alexandria and Georgetown Railroad, leased by the B&O. Civil War-era poet Walt Whitman and his partner Peter Doyle often crossed the Potomac River at Long Bridge on their long hikes outside of the city. In 1872, the Pennsylvania Railroad (PRR) obtained control of the bridge and railroad through its Baltimore and Potomac Railroad. On July 2, the Alexandria and Fredericksburg Railway opened, providing the first direct all-rail connection between the north and Richmond, Virginia. The B&O regained its link to the south on March 10, 1874, with a car float between Shepherds Point in Washington and the Washington City, Virginia Midland and Great Southern Railway in Alexandria. (The temporary Shepherd's Landing Bridge would be built there during World War II). By June 6, 1896, the bridge was also traversed by an interurban streetcar line: the Washington, Alexandria, and Mount Vernon Electric Railway. The railroad-only Long Bridge, a through-truss swing bridge, opened on August 25, 1904, about 150 feet (45 m) upriver from the old bridge. The two-track bridge contained girders recycled from the PRR's Lower Trenton Bridge across the Delaware River. The old bridge was demolished sometime after late 1906. In 1901, trackage rights over the bridge were obtained by the Richmond, Fredericksburg and Potomac Railroad, a bridge line owned equally by six companies including the PRR and B&O (which obtained trackage rights over the PRR to reach the bridge on July 1, 1904). In 1991, the RF&P was merged into CSX Transportation, which acquired the bridge itself in 1998, after the Conrail breakup. A new swing-span through-truss bridge called the Highway Bridge, 500 feet (150 m) upriver from that bridge, opened February 12, 1906, to serve streetcars and other non-railroad traffic. On November 9, 1943, a plate girder replacement to the 1903 railroad bridge (keeping the old through-truss swing span) opened. A new single-span, northbound-only 14th Street Bridge opened on May 8, 1950. Highway Bridge became southbound-only. The northbound 14th Street Bridge was named the Rochambeau Bridge on October 19, 1958. The new George Mason Memorial Bridge opened upstream on January 26, 1962, replacing the old Highway Bridge (then southbound only). The Highway Bridge was finally removed from the site in 1967, and was taken to the Naval Surface Warfare Center, Dahlgren Division, for bombing practice. In 1972, a third bridge opened immediately downstream of the southbound (Mason) bridge, carrying two express lanes in each direction. These lead directly to the high-occupancy vehicle lanes on Virginia's section of I-395 (though the express lanes on this bridge are not HOV lanes themselves and are available to all traffic). The final bridge, the Charles R. Fenwick Bridge, carrying the Yellow Line, opened on April 30, 1983. Potomac River traffic by sea-going vessels traveling above the Long Bridge ceased in 1961. The last time the Rochambeau and Long Bridges were opened was on March 3, 1969, to remove barge and crane equipment that had been floated upriver in 1967 to remove the old Highway Bridge piers and install new center bridge piers. The Rochambeau bridge was redecked in 1975, with its bascule draw span eliminated at the same time. The 1950 and 1962 spans incorporated draw spans whose control houses are still visible, complementing those on the Arlington Memorial Bridge upstream and on the railroad bridge's swing span downstream. Later bridges did not incorporate this feature, and the draw mechanisms were abandoned. On January 13, 1982, the northbound I-395 span was damaged by the crash of Air Florida Flight 90. The Boeing 737-222, which had accumulated ice while idling on the runway at National Airport, stalled soon after takeoff, fell on the bridge, and slammed into the iced-over Potomac River. The crash killed 74 passengers and crew, plus four people in cars on the bridge. The repaired span was renamed the Arland D. Williams, Jr. Memorial Bridge in spring 1985 after one of the passengers, who passed a lifeline to five survivors before permitting himself to be rescued. He succumbed to hypothermia and drowned while rescuers worked to rescue the last of the survivors. The name Rochambeau Bridge was shifted to the previously unnamed express-lane bridge. On July 25, 1989, the 14th Street Bridge gained national notoriety as the scene of the 1989 DC Prostitute Expulsion. In 1994, Abubakar Sadiq Ibrahim, an unemployed journalist, who said he wanted to see the daughter who lived with his estranged wife, crashed his Mercedes-Benz into a retaining wall on the span and threatened to explode a bomb. A black canvas bag on his front seat turned out to contain books and clothes. The Arland D. Williams Jr. Memorial Bridge as seen from a Yellow Line train on the Washington Metro (Charles R. Fenwick Bridge). After a series of inspections from 2005 to 2009, the District of Columbia's District Department of Transportation (DDOT) began a $27 million rehabilitation of the northbound main span in 2010. Construction, scheduled to last only a few months, was finally completed in 2011. A 2014 inspection found more problems. Citing the expense and the need to replace or repair several deficient bridges elsewhere in the District, DDOT pushed the date for fixing these problems to 2020. In coordination with the Federal Railroad Administration (FRA), DDOT is conducting a comprehensive study for the rehabilitation or replacement of the Long Bridge. The study area extends 2.2 miles, beginning at the RO Interlocking (MP 110.1) in Arlington and extending northeast, along the existing rail alignment, to the CP/Virginia Interlocking (MP 112.3) in Washington, D.C., east of L'Enfant Plaza. The FRA is the Lead Federal Agency for the project and DDOT is the Joint-Lead Agency for the National Environmental Policy Act (NEPA) compliance process. Public involvement for the study will include outreach at key project milestones such as the public scoping period which will be conducted in accordance with NEPA regulations and planned for May 2016. Three rounds of community meetings are scheduled during the study's Phase II, which is presently in progress. Funding for design and engineering of a Long Bridge rebuilding or replacement is included in Virginia's Atlantic Gateway project. List of bridges documented by the Historic American Engineering Record in Washington, D.C.
^ "Virginia Freeway HOV Lanes". Roads To The Future. Retrieved July 15, 2009. ^ a b c d e Cohen, Robert (2013). "History of the Long Railroad Bridge Crossing Across the Potomac River". DC Chapter, National Railway Historical Society. Archived from the original on February 3, 2014. Retrieved 29 July 2014. ^ "To bike across the Potomac, most use the 14th Street Bridge or Key Bridge". Greater Greater Washington. Retrieved October 31, 2018. ^ Peck, Garrett (2015). Walt Whitman in Washington, D.C.: The Civil War and America's Great Poet. Charleston, SC: The History Press. p. 104. ISBN 978-1626199736. ^ "Ingenuity Marks Bridge Renewal," Railway Age, vol. 118, No. 3 (January 20, 1945): 187–90. ^ William H. Rehnquist. Remarks at the Arlington Historical Society Banquet Archived February 3, 2014, at WebCite. April 27, 2001. Retrieved January 25, 2008. ^ "No Space For Cars". The Washington Post. May 9, 1950. p. 10. ^ "Potomac Highway Bridge Opening Ceremony Today". The Washington Post. May 9, 1950. p. 1. ^ "Span Dedication Set for Oct. 19". The Washington Post. September 16, 1958. p. B1 ; "14th Street Span Named Rochambeau". The Washington Post. October 20, 1958. p. B1. ^ Schuette, Paul (January 27, 1962). "George Mason Bridge Opened to Traffic". The Washington Post. p. C2. ^ Washington D.C. Chapter of the National Railway Historical Society. "Washington, D.C. Railroad History". Archived from the original on April 21, 2006. Retrieved April 26, 2006. ^ Eisen, Jack (December 23, 1983). "Honor for Hero Urged". The Washington Post. p. C2 ; Eisen, Jack (January 15, 1985). "Bridging a Dilemma". The Washington Post. p. B2. ^ Reid, Alice; Davis, Patricia (November 5, 1998). "Jumper on Bridge Causes Gridlock". The Washington Post. Retrieved August 24, 2006. ^ Dildine, Dave (June 25, 2015). "DDOT details area's structurally deficient bridges". WTOP. Retrieved September 1, 2015. ^ "Welcome to the Long Bridge Study Phase II". Long Bridge Study. Washington, D.C.: District Department of Transportation, Government of the District of Columbia. Archived from the original on 2016-01-03. Retrieved 2016-01-30. ^ "Public Involvement". Long Bridge Study. Washington, D.C.: District Department of Transportation, Government of the District of Columbia. Archived from the original on 2016-01-31. Retrieved 2016-01-30. ^ "Virginia seeks project manager for Atlantic Gateway". Railway Age. February 7, 2017. Retrieved February 9, 2017. Wikimedia Commons has media related to 14th Street Bridge and Long Bridge. Cohen, Robert (2003). "History of the Long Railroad Bridge Crossing Across the Potomac River". Washington, D.C.: Washington Chapter, National Railway Historical Society. Archived from the original on February 3, 2014. Retrieved February 3, 2014. Historic American Engineering Record (HAER) No. DC-50, "Long Bridge, Spanning Potomac River near Jefferson Memorial, Washington, District of Columbia, DC"